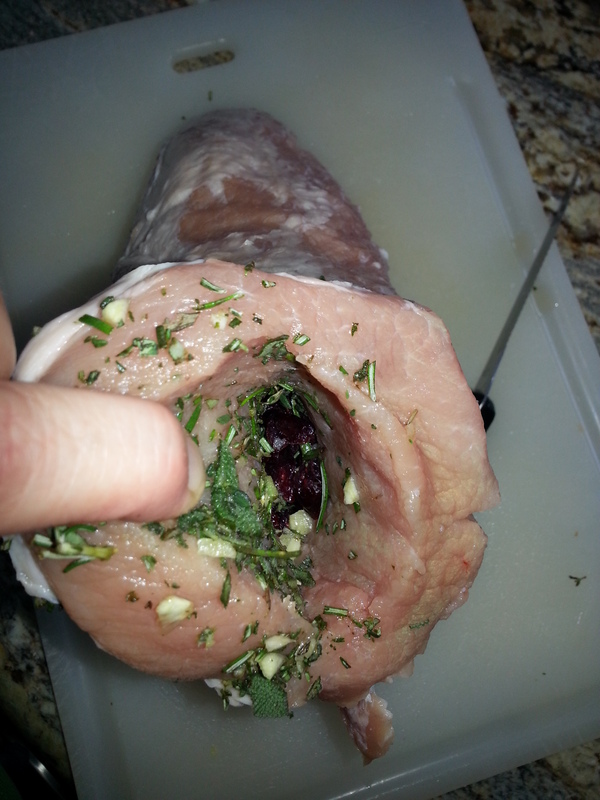 Pork Roast stuffed with herbs and dried cranberries soaked in Marsala. 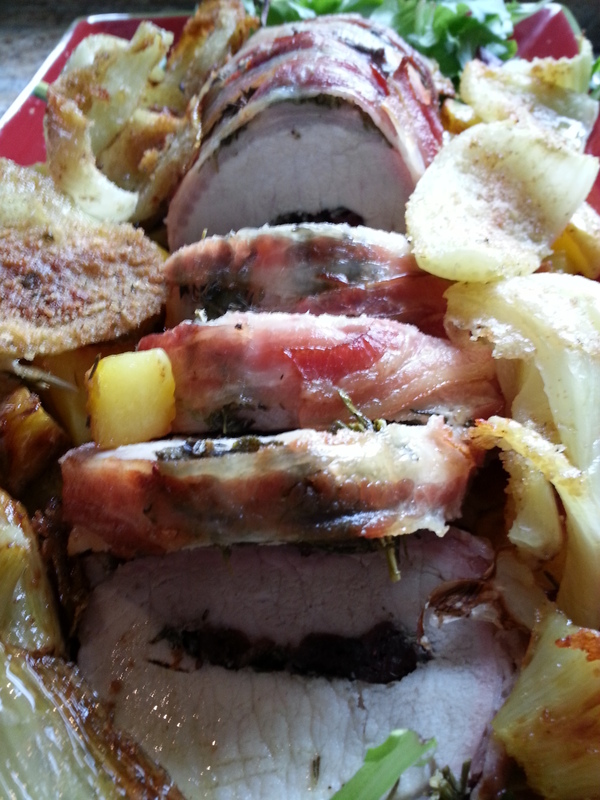 Pork Roast is lower in cholesterol and a good source of Iron, Potassium, Protein, and Selenium (needed for the thyroid). Consumed once a week pork ensures an additional intake of omega 3s and vitamin B12. With a “Chef’s Knife” cut a slit into the center of the pork. Place cranberries and Marsala together in a bowl, set aside. Using a food processor add Sage, Rosemary, Thyme, Garlic and “pulse” herbs for 20 seconds. With a long sharpened “chef’s knife”, insert into the wide end of the pork roast and begin to make a pocket slit for the length of the pork without the knife coming out of the meat. Reserve Marsala in a separate dish, combine soaked cranberries and herbs together, then begin to fill the inside of pork pocket slit until about 3/4 the way full, pushing down with end of wooden spoon in order to optimize the filling. Rub salt onto entire roast. Layer with herbs and bacon, optional. Place into baking dish; may tie off pork roast with a single string encircling the meat from end to end to close pork roast and tie with a knot, or tie the entire roast with the twine. 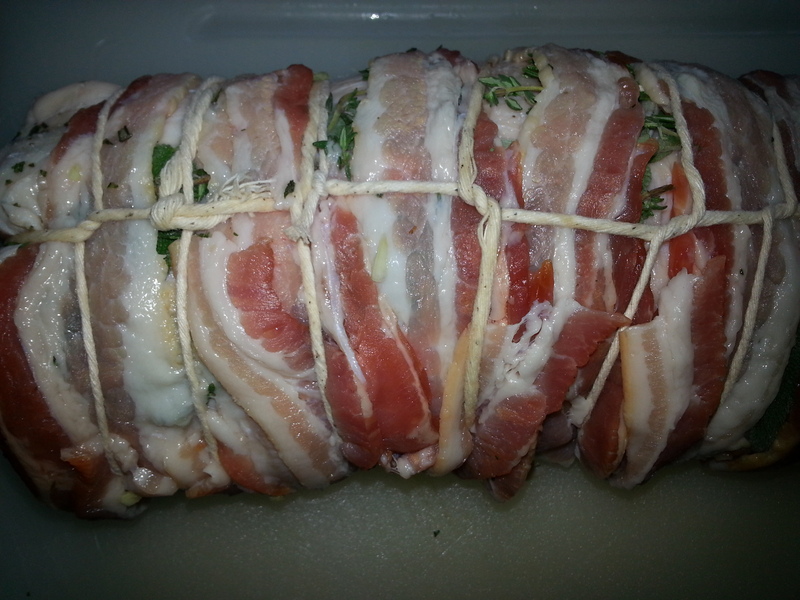 Optional: layer pork with bacon and herbs, then tie off the pork to secure stuffing inside pork pocket. (How to Tie a Pork Roast Video http://www.myrecipes.com/how-to/video/tying-stuffed-pork-roast-loin-10000001847834/ ) Drizzle reserved Marsala on top of pork roast. Cover dish and place into oven and allow to bake on 350F for 20 minutes per pound of pork. Pull from oven and allow to relax for 10 minutes. Thinly slice the pork (thickness of a nickel) and serve on a bed of mixed green salads. Excellent with Acorn Squash Soup.